On Feb 28th I decided to drive out to INFINITI Of Boerne to look and test drive the 2019 QX50 with my son. Just as we got there, it started to rain and Katerina (Katie) Klein, Sales Consultant walked out in the parking lot to greet us. From that moment on and most of the morning, my son and I were treated as if we were long time family members. Katie showed us numerous vehicles and exactly what I was looking for. We test drove several and I fell in love with this Black QX60 which was fully loaded. Katie took the time to explain all the details of the QX60 and with no sales pressure at all!!! She introduced us to the Sales Manager and the Finance Officer. 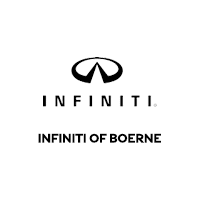 The entire staff at INFINITI of Boerne was above any expectations I have every encountered in looking for a new Vehicle. The feeling of welcoming when you arrive is unexplainable. Great and fast and super friendly service is what I love about this place. The biggest factor for me is the personal attention I receive. My service rep Jose Rodriguez has always gone way and beyond and I really appreciate that. Great job guys!!! My daughters first car!!!! What a great experience at INFINITI of Boerne!!! I worked with Katerina and she did an excellent job! My time was limited, so she worked well through text and email and was very responsive, transparent and was not pushy at all. She understood my needs and worked to meet them and provide a great customer experience. She went out of her way to deliver the car and borrow a huge red bow to put on the car to surprise my daughter. Great prices, cars and great service! Would highly recommend if looking for a vehicle! Just want to give kiddos regarding the stellar service we have received from INFINITI of Boerne. With special call out to the best Service Advisor(Shawndy), that I have experienced over many years of purchasing and servicing vehicles. I live in San Antonio. INFINITI of Boerne is the ONLY dealership I trust. Shawndy in the service department is beyond awesome. Always the best customer service, trusted, honest, and attention to detail and time of the customers needs. They are worth the drive. Got a great deal! Katerina, out sales associate was so helpful! Would recommend to anyone looking for new or used vehicle to give them a chance. We have bought two cars from this dealership and every time our experience has been better than one could hope to have. There were never pressure tactics, annoying calls or pushy sales people trying to up sell the customer. Over and over I heard, “We just want you to be happy.” The service from sales to the actual service dept compares with the most high end in the industry WITHOUT being pretentious or stuffy. Boerne has a very unique gem in INFINITI of Boerne. They partner with their customers, know them by name and welcome you back time and time again. Go check them out.... it’s worth the drive for sure.